Key Largo Hotel's Guests Steps From Marina Adventures Ideally situated next to Key Largo Resorts Marina, this hotel's location places patrons in the perfect position to take advantage of endless Florida Keys fun! Those seeking hotels in Key Largo for that relaxing tropical vacation or corporate retreat find the Holiday Inn Key Largo hotel to be just what they're looking for. From days spent oceanside beneath the Florida sun to snorkeling and scuba diving adventures to romantic sunset cruises, Key Largo recreation is what vacation fantasies are made of. Take the family to John Pennekamp Coral Reef State Park to see the 30,000-gallon aquarium or get even closer to marine life by swimming with the dolphins at Dolphin Plus. 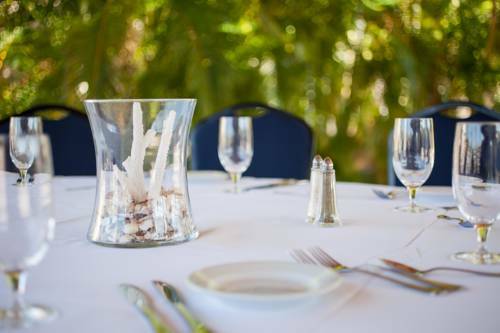 A 55-minute drive south from the bustle of Miami, this resort's event facilities offer a quiet, relaxed atmosphere that is ideal for sales meetings and corporate gatherings. Gain a new perspective on your business plan as you convene in one of five function rooms, or celebrate successes in the 2,000-sq-ft Tiki Hut Pavilion. A 24-hour Business Center offers more support, and free wired and Wi-Fi access is provided throughout the property. Complete with every perk from on-site dining and a poolside Tiki Bar to two heated, outdoor pools and a 24-hour Fitness Center, this Florida Keys hotel's accommodations in Key Largo ensure a memorable travel experience. It's an island paradise from the moment you arrive. Book today! Casablanca I: Our keys casual atomosphere will allow your team members and clients to feel relaxed while accomplishing a successful program. Please contact the Sales office directly for more information at 305-453-7150. African Queen: We can accommodate your audio visual needs. Please contact the Sales office directly for more ifnormation at 305-453-7150. Casa I/African Queen: We can accommmodate your next event in style. Please contact the Sales office directly for more information at 305-453-7150. Tradewinds PlazaPublix grocery store, K-Mart, Radio Shack, Payless Shoesource, Icean Cream Shoppe, Jewerly Store, Bealls, First State Bank, Public Library, Florida DMV, Art store, Vegas Fun, etc. Florida Keys Outlet CenterOutlet center located 20 miles north of Key Largo featuring Gap, Levi's, Nike, Tommy Hilfiger, Coach, NYC Sunglasses, Carter's, OshKosh B'gosh and more. Keys Gate Golf CoursePlay a round of golf or enjoy lunch. Located in Florida City. Open daily. Florida Keys Outlet Center55 Outlet Stores. Find impressive savings at Aeropostale, Carter's, Gap Outlet, Guess, Nike, Nine West, OskKosh B'gosh, Tommy Hilfiger, Coah and many more. Jacob's Auquatic CenterOlympic size pool for laps, pool with diving boards, smaller pool for relaxing, and Pirate activity area wadding pool. Fun for all ages. Dolphin CoveDolphin Cove is a marine education and dolphin swim facility in our natural lagoon open to the Florida Bay. Enjoy our Florida Everglades Tours and Flamingo Express private charters departing from our key Largo facility.